CBSE Sample Papers Class 12 Engineering Graphics 2019 The new marking scheme and blueprint for class 12 have been released by CBSE. We are providing Engineering Graphics sample papers for class 12 CBSE board exams. Sample Papers are available for free download in myCBSEguide app and website in PDF format. CBSE Sample Papers Class 12 Engineering Graphics With Solutions of 10+2 Engineering Graphics are made available by CBSE board exams are over. CBSE marking scheme and blue print is provided along with the Sample Papers. This helps students find answer the most frequently asked question, How to prepare for CBSE board exams. CBSE Sample Papers of class 12 Engineering Graphics for 2018 Download the app today to get the latest and up-to-date study material. CBSE sample paper for class 12 Engineering Graphics with questions and answers (solution). myCBSEguide provides CBSE class 12 Board Sample Papers of Engineering Graphics for the year 2018, 2019,2020 with solutions in PDF format for free download. The CBSE Sample Papers for all – NCERT books and based on CBSE latest syllabus must be downloaded and practiced by students. Class 12 Engineering Graphics New Sample Papers follow the blueprint of that year only. Student must check the latest syllabus and marking scheme. Sample paper for class 12 Engineering Graphics and other subjects are available for download as PDF in-app too. myCBSEguide provides sample paper with solutions for the year 2018, 2019, 2020. Use both sides of the drawing sheet, if necessary. Missing and mismatching dimensions, if any, may be suitably assumed. In no view of question 2, are hidden edges or lines required? In question 4, hidden edges or lines are to be shown in views without section. Number your answers according to questions. Answer the following Multiple Choice questions. Print the correct choice on your drawing sheet. 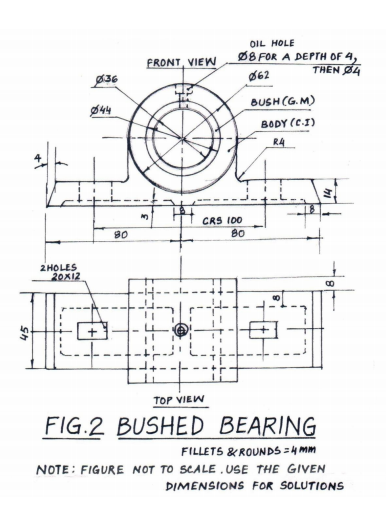 Which one of the following is used to join shaft and hub? Which one of the following is represented by thin continuous lines? An inverted frustum of a square pyramid (base edges 40mm and 50mm, height 35mm) is resting on H.P with two of its base edges perpendicular to V.P. Draw its isometric projection. Show the axis and indicate the direction of viewing. Give all the dimensions. A sphere (diameter 70mm) is placed centrally on the top hexagonal face of a hexagonal prism (base edge 25mm, height 50mm). Two of the base edges of the prism are parallel to V.P. The common axis is perpendicular to H.P. Draw the isometric projection of the combination of solids. Show the common axis and indicate the direction of viewing. Give all the dimensions. Draw to scale 1:1, the standard profile of a Knuckle Thread, taking enlarged pitch as 50mm. Give standard dimensions. Draw to scale 1:1, the front view and top view of a Square Headed Nut of diameter 30mm, keeping the axis vertical. Give standard dimensions. Sketch freehand the front view and top view of a Pan Head Rivet of size M20, keeping the axis vertical. Give standard dimensions. Sketch freehand the front view and side view of a Collar Stud of size M20, keeping the axis horizontal. Give standard dimensions. 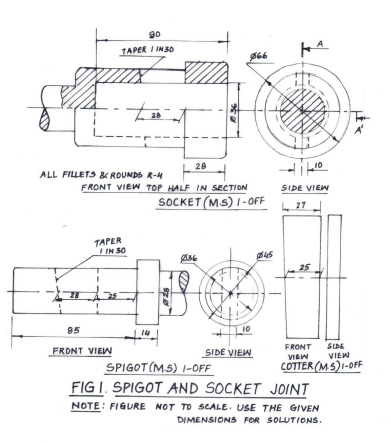 Figure 1 shows the details of the parts of a SOCKET AND SPIGOT COTTER JOINT. Assemble these parts correctly, and then draw the following views using scale 1:1. Front view, upper half in section. Left side view. Print the title and the scale used. Draw the projection symbol. Give 6 important dimensions. Front view left half in section.